Most people can’t wrap their mind around the fact that putting crap in your body now might one day give you cancer. After working in product development, retail, and design for several decades, Sherri Coates realized how dodgy the beauty industry was. 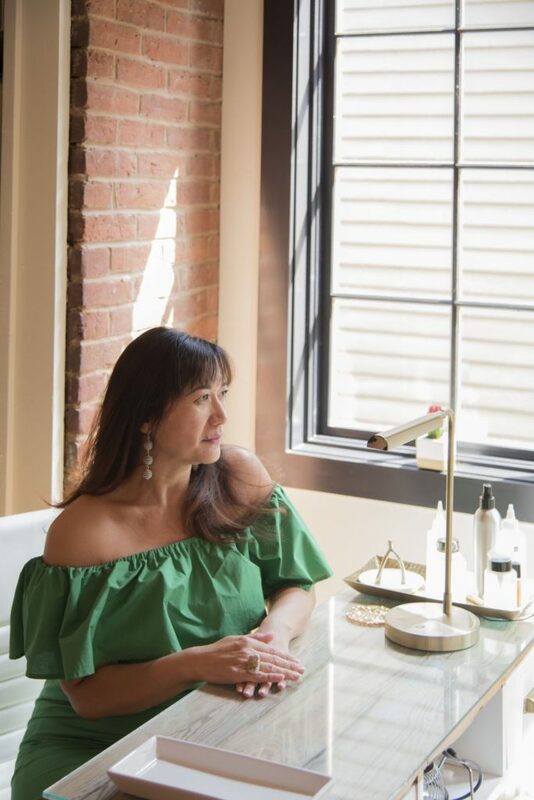 The co-owner of Nashville-based spa and salon, Poppy & Monroe, founded with business partner Karen Kops, couldn’t turn off a voice in her head that said, you have to tell others what you know. The pair committed to doing the research and providing nontoxic, eco-friendly products and services. Their comeback to those who question the cost is, “What does your health mean to you?” Born in the Philippines and raised in California, Coates was on the green bandwagon long before most of us got the memo. For years, she climbed the corporate ladder at department store chains and textile companies. While traveling around the globe, Coates realized how beauty products were really made. In her spare time, Coates self-educated. Appalled by her findings, she was motivated enough to reinvent herself. In this phase, she finds fulfillment supporting her female tribe. Poppy & Monroe promotes a culture of taking care of oneself—and others—from the inside out. SC: I actually was supposed to go into International Business at UCLA and follow my dad’s path. He was an arbitrator between the US military and Philippine government. One day, when I was a senior in high school, a speaker came and spoke about the fashion industry. I had long been fascinated with this career path since I began working in retail at age 15. Growing up, I dressed my friends for special events and was the one they wanted to go shopping with. I ended up attending the Fashion Institute of Design & Merchandising. Prior to graduating, I was accepted into a big department store chain’s executive training program. From there, I was on my path to becoming a retail buyer, which is what I did for the next ten years of my life. Then I saw you transitioned into the textile world. How did you make that leap? SC: Back when I started in fashion, you were not only buying but also developing and designing product. It was natural that I learned manufacturing and once you’re in that industry, the same principles tend to apply to many other design industries. I began traveling a lot very early on to develop products for different department stores. For years, I fluctuated between China, India, Europe, New York, and LA. How did your background in product development and design play into the curation of your salon Poppy & Monroe? SC: My business partner Karen and I are so picky about what goes on our shelves. There are so many products that claim to be good for you that aren’t. As a whole, beauty products aren’t regulated as well in the US as they are in other countries. Why do you think more people aren’t pickier about what goes into their bodies? SC: In these times, I would think people would be more aware but that is assumptive. When I moved to the South from California I was completely floored that there weren’t many natural hair salons and spas. What I hear is that people think natural products aren’t as effective and cost more money. I think you also have to see your health as a worthy investment. SC: Definitely. We tread lightly on scaring people but I don’t mind asking them how much they value their health. We’ve become such a medical-based, easy fix world, which is sad because a lot of beauty issues can be solved in more holistic ways. How did you and your business partner educate Nashville’s community? SC: First we gained their trust. Next, we committed to being a service oriented provider, which meant that we could teach our clients over time about self-care. Our goal is to help them prioritize scheduling in self-care. We’ve never paid for advertising. As you know, word of mouth is the best source of promotion. Call it hippie logic, but I think if your heart is in the right place things will always flourish. SC: Absolutely. I don’t come home exhausted like I used to when I was working in the corporate world. The information that we’re sharing is so important and I strongly feel that this is the season I’m supposed to be in. Would you say your job is life giving? SC: On most days. (Laughs) Right now I’m mentoring a lot of young women on our team, many of whom have had really challenging lives. They went into the salon world to find beauty. I love that. Where does your desire to build up other women come from? SC: I lived The Devil Wears Prada competitive life. Many of the older women treated me like crap. Go get me this. You did that wrong. That’s why I have such a stake in making sure women are treated well. I want to offer a place where women can feel vulnerable, nurtured, and cared for. We all need to support one another—especially in this polarized political landscape. I also think it’s important for women to feel both feminine and fierce. SC: Women are holding positions that only men used to and therefore, I think they hold a lot of emotions in. It’s really challenging to be a woman these days. I just turned 48 and am not married, now, do I have kids. It’s not that I didn’t want them but it just didn’t happen. I think part of maturity is being transparent about who you are. Everyone is on their own path and this is mine. Do you think most women feel comfortable being themselves? SC: My group of friends do but it also might be because we’re a little older. At this point in my life, it’s less about show and more about authenticity. Who has time for the other stuff? I really do believe beauty is within. You can change your appearance externally but a person can’t change their soul. If you go around pretending, you’re going to be found out. SC: The connections. I was in a world that was very male and money-oriented. Now I’m in an environment where it’s not about what do you need from me? Every relationship I have these days is mutually beneficial and that is beautiful.